男性有少量的乳腺组织，但它仅有一些导管组成，纤维间质中没有小叶。它可能是单侧的也可能是双侧的。有时它可能出现于青春期或者随年龄增长而出现。男性乳腺发育可由肝硬化、睾丸间质细胞瘤或药物引起。可见到导管上皮细胞增生或如这里所见有明显的导管水肿。 Males have a small amount of breast tissue, but it consists of just a few ducts, without lobules, in a fibrous stroma. It may be unilateral or bilateral. Sometimes it can occur at puberty or sometimes with aging. Gynecomastia may occur with cirrhosis of liver, Leydig cell tumors of testis, or with drugs. 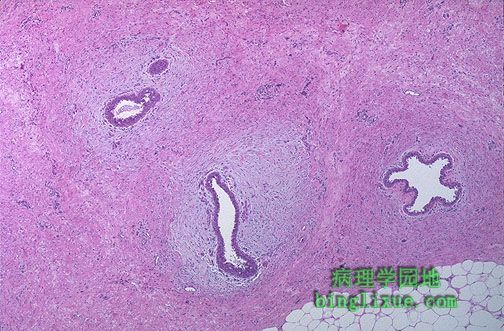 There can be ductal epithelial hyperplasia, or prominent periductular edema as seen here.